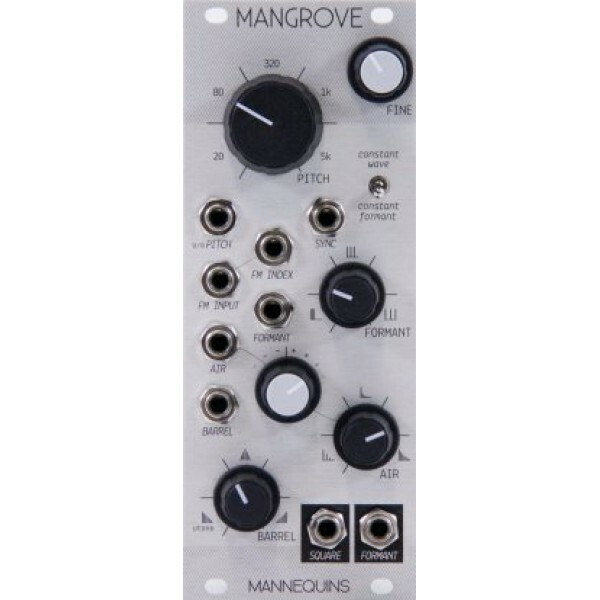 The Mannequins Mangrove holds the essence of an instrument in the form of an oscillator. Sounds are defined not only by pitch but by spectra. As the earth shakes under foot, a whistle blows on the wind. FORMANT represents the timbral structure of the instrument, defined independent of its pitch. Waves shift across the range, bringing to life a series of undertones. There is quicksand between these divisions - tiny moments of uncertainty - where multiphonics reside. These underbranches fold melodies onto themselves far down into microtones. Frequency modulation feels altogether different, with a pair making the most corporeal of complexx oscillators. With integral FM indexing, a cross-modulated duo will unleash a snarling Bunyip. With SYNChronicity they will sing the same tongue through their own voice. Self-patched tones open another box of uncertainty. Divided FORMANTS to control frequency shapeless SQUARES modulating air pressure.